Take control of a Hindu God and and visit the Monochrome, VGA, and modern gaming eras. Awaken the inner mouse in you. 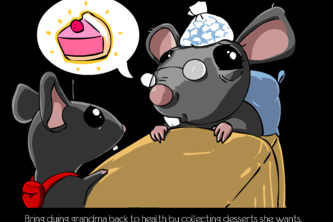 Save your grandma from dying by bringing lots of desserts! Roll big delicious donuts for your precious dying mouse grandmother.